Munsell Color is happy to announce our latest new book release, “The Munsell Book of Color – Matte and Glossy Collections,” aimed at helping professionals and artist with identifying colors. The new and improved Books of Colors helps people design and specify color using a system organized to correlate with the way eyes see color and also the way color is produced in everyday products. The color chip book is based on the company’s color identifying system which is the standard for today’s computer-based color matching systems. The “Munsell Book of Color – Matte and Glossy Collections” will allow people to easily identify and order colors through the supply chain. 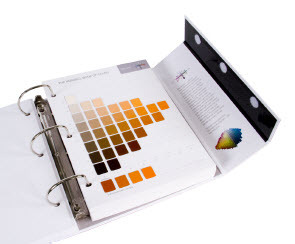 Designed as a portable and durable guide to the Munsell Color System that lets people match, specify or design colors anywhere. The Glossy Collection is made up of one volume with more than 1,600 Munsell removable color chips. The Matte Collection includes many colors from the Glossy Collection, but in a softer, matte. It includes one volume with more than 1,300 Munsell removable matte color chips. Open the door to a world of color, accurately and neatly organized. Are you using the Munsell Books of Color? We would love to hear about it and invite you to Tell Us Your Story.